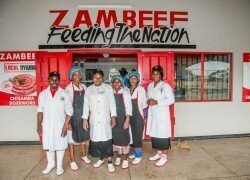 ZAMBEEF Products shareholders have approved a deal that paves the way for the group to restore its Zamhatch and Zam Chick businesses to full Zambian ownership through a US$23 million cash buy-back of shares from a South African joint venture partner. Shareholders, at a meeting in Lusaka, agreed on plans for the company to raise US$65 million in new capital to take full ownership of the subsidiaries as well as further reduce its debt levels and fund capital investment plans. The transaction would also lessen Zambeef’s exposure to exchange rate fluctuations. The Zamhatch hatchery and Zam Chick broiler divisions were set up as joint ventures between Zambeef and RCL Foods in 2013, with Zambeef holding 49 percent of Zamhatch and 51 percent of Zam Chick. Under the agreement, RCL of South Africa had an option to sell its shares back to Zambeef for cash or Zambeef shares equivalent to US$14.25 million for RCL’s stake in Zam Chick and US$9.126 million for Zamhatch. The ‘put’ option was exercisable on or before September 23, 2016. Under the transaction CDC is investing US$65 million in Zambeef: US$9.5 million in return for 52.6 million ordinary shares and US$55.5 million for 100 million convertible redeemable preference shares. The investment gives the institution a 17.5 percent stake in Zambeef, which is listed on the Lusaka and London stock exchanges. “We thank all our shareholders for their continued support to Zambeef. It is a measure of CDC’s confidence in Zambeef, its management and business model that one of the world’s most well-respected and prudent investment houses has opted to invest in the company,” said Zambeef chairman Dr Jacob Mwanza. The move is also in line with the strategic objectives set out in the company’s annual report to reduce gearing and focus on its core business of cold chain food processing and retailing, and will allow it to continue to roll out expansion of its distribution and retailing platform in Zambia and the region. The National Pension Scheme Authority (NAPSA) – to which every employee and employer in Zambia contributed – was the single largest Zambian shareholder in Zambeef, owning some 25 million shares amounting to 10 percent of the company.